It is a common question we get from our clients - "Who should we trust when it comes to dashboard builders and data visualization?". Tableau and QlikView have established themselves as market leaders, and there is plenty of information about the technical capabilities or limitations of each. Here, we are having a look at their popularity across the globe. Using Google Key Words and Analytics, we have projected on a world map the provider which saw more interest in each country. As evident from our map, Tableau (in blue) dominates Northern America, France and some of South East Asia, while QlikView (in green) enjoys greater global interest overall (58.9%), and in the majority of regions, including EU, India, Latin America and the Pacific. "Despite Tableau accounts for about 41% of the search we studied, the market competition for these searches is greater in the top 10 locations we closely reviewed, translating into EUR 3.25 (GBP 2.73; USD 3.63) an average per click which businesses pay for this key word", explains Pedro Pereira, our BI & Data Specialist who is in charge of Kalinax Insight Analytics. For more explicit advice on which countries to advertise in, visit our QlikView and Tableau specific interest overviews. QlikView mainly dominates the region in terms of brand value. In the UK and Germany, the interest in QlikView is double the interest in Tableau, while in Italy, Spain and Sweden it is quadruple. 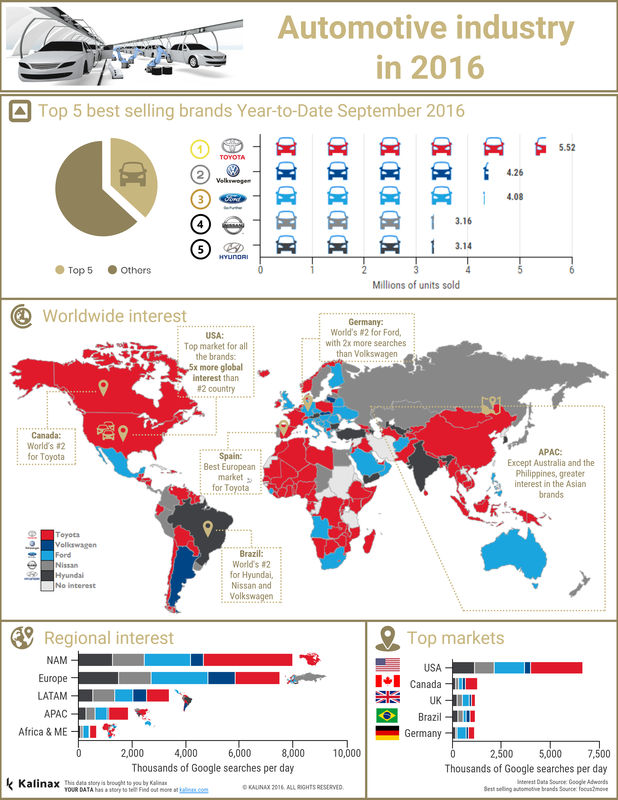 Austria and Switzerland generate the same interest towards both brands, while Tableau dominates France and Belgium. If you are a QlikView-driven business, there is room for you in Denmark, Norway, Sweden and the Netherlands. The UK and Germany are also not overcrowded. If you are a Tableau-driven business, there is room for you in Portugal, Slovenia, Spain and Switzerland. France and Belgium are your hot-spots but could be more pricey to start. Tableau is strongly established in North America. In both USA and Canada, Tableau generates double the interest (in terms of Google searches), compared to its rival. We consider Canada to be the best market to launch a Tableau-driven business - offering a great value for money and significant interest in your products and services. Go for USA if you are in business with QlikView. Latin American markets have a clear preference for QlickView. The further south you go, the more QlikView dominated territories you will encounter. Chile and Argentina are both QlikView's strongholds, and in Brazil Tableau generates 3 times less interest than QlikView. Columbia and Mexico show no preference. With India generating 179 average daily searches in QlikView compared to only 6 for Tableau, it is no wonder QlikView dominates this part of the globe, even though it performs much better in other geographies in the region. Australia and New Zealand have a slight preference for QlikView, however they offer a better value-for-money for Tableau-driven businesses. Australia is only second to Canada for you. Japan does not demonstrate any clear preference for either brand, as well as the South-East Asian region (as a whole, there are variation between countries), Israel and the United Arab Emirates. Singapore and Indonesia offer great value for money for QlikView-based business. Africa is a territory not dominated by neither QlikView or Tableau. The only market where you will find significant interest volumes in the region is South Africa - generating an average of 25 QlikView directed searches and 5 Tableau ones. The cost to advertise in either is almost the same. 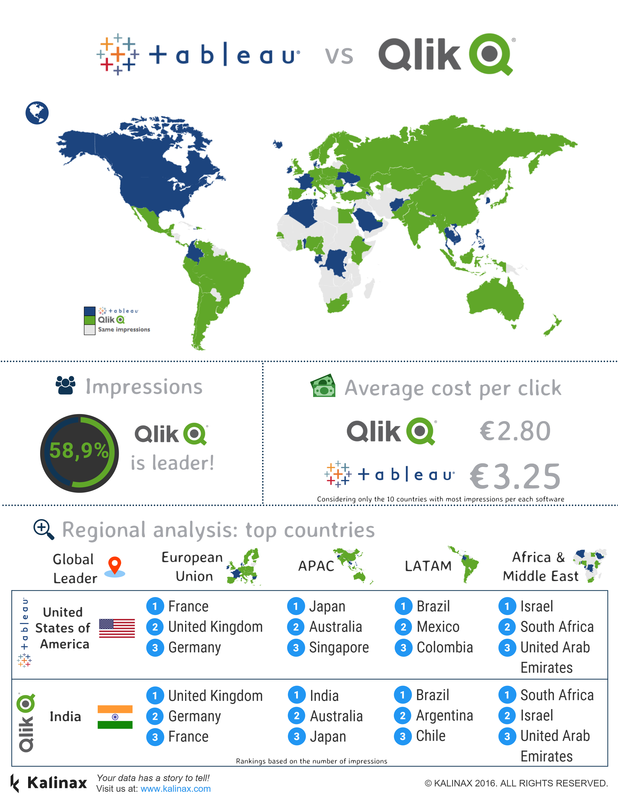 South Africa (SA) currently constitutes over 90% of the market in the continent with Morocco being the only other geography which generates more than 1 Tableau/ QlikView search per day (on average). This makes Africa a great unexplored opportunity which would offer you many challenges but also little competition and low costs - when we say law, we mean close to 0 outside SA. Need help with Tableau or data?